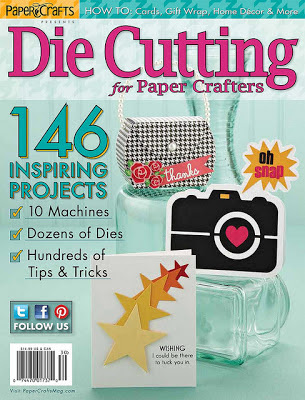 Paper Crafts is releasing a new super fun special issue this week, called Die Cutting for Paper Crafters… an entire issue devoted to creative and innovative ways to use your dies… imagine how thrilled I was when I was asked to participate! Trust me when I tell you this issue is *full* of amazing inspiration. 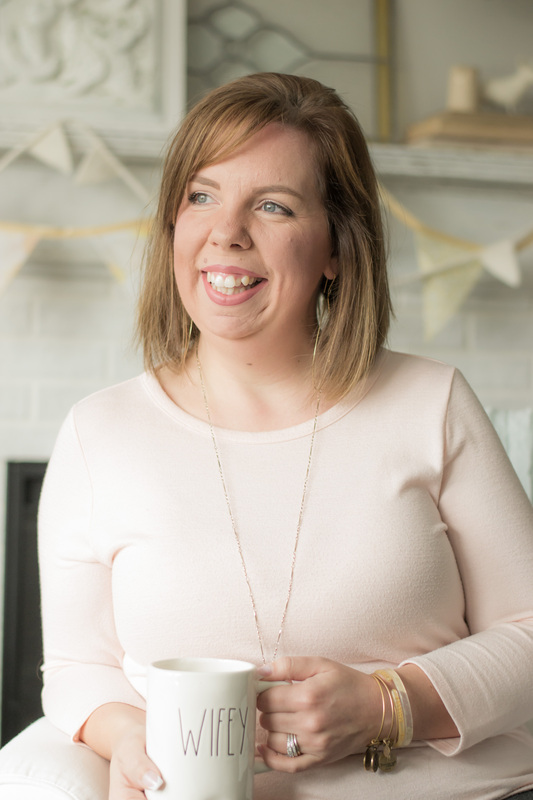 I am super excited to be participating in a blog hop celebrating the release of this issue, along with a group of wonderfully talented designers. 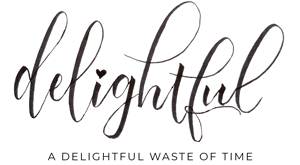 You should have arrived here from Mary Dawn Quirindongo’s blog. 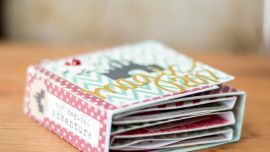 If not, you can always go back to the Paper Crafts Connection blog, and start at the beginning! For today’s hop, we were challenged to use our dies to cut through something other than paper. Because why should paper get all the fun? 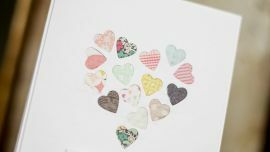 When you start to use your dies on other materials, you expand your crafting arsenal – and we all love it when we have more stuff to play with, right? For today’s card, I chose to work with some self-adhesive, glittery fun foam… you know the stuff. Your kids build all kinds of bookmarks and door hangers with this stuff. I had some on hand (I wish I could tell you it belonged to my girls, but no… I am a magpie girl, and couldn’t resist it’s sparkly beauty during a trip to the craft store! ), and it cuts like butter. And since this sheet was self-adhesive, I could cut it with an intricate die, and it still stuck to my project easily, and cleanly! So, since we agreed that fun surprises are the best kind, how about another one? Paper Crafts has generously offered one of these issues to one of YOU! All you have to do is leave a comment on my post before Tuesday, November 20th, and you’re in the running! Thanks so much for stopping by, and don’t forget to hop to your next stop… the incredibly talented Vanessa Menhorn! Happy Birthday – and a *Winner*! Fabulous card. Love the glittery fun foam snowflake. Sparkly fun foam??? Cool. And extra good that it's light and doesn't mean extra postage or breaking the sorting machines! This is so cute! I like the glitter foam that you used! I might have to get some on my next craft shopping trip! Stunning card. Perfect for Christmas. Gorgeous, Meredith! Love the dimension the sparkly foam gives the pretty snowflake! Such a pretty backdrop for the rest of your dies and sentiment! Lovely layers, too, as always! what a great idea! why limit fun foam to the kids? omg that is fun foam?! love it! This is such a pretty card. You have used all of the elements that I love. Thanks for the inspiration. Oh love how the glitter foam turned out! Love! Love! Foam?! What a fantastic idea! And I'm like you, I can't resist sparkly things! Thanks for the inspiration. Beautiful card! BEAUTIFUL!!! I love how well this cut – and your color combo is absolutely to die for! Gorgeous! What a sparkly festive card! I love the dimension the fun foam gives to it. Fabulous! That fun foam looks fantastic, what a great idea! I am going to have to try this, I love the colors on your card too, so pretty and elegant! Oh I haven't seen glitter foam in craft stores yet! But it's so perfect for the holidays! Love the sparkle! Beautiful card! I didn't know the fun foam came with sparkles! Beautiful! I love all the textures and the snowflake is my favorite. So clever! Love the use of glittery fun foam on a card! Thanks for the idea about running the foam through a few times to make sure the snowflake gets cut. I might have been frustrated without this tip. I have it on my to-do list now to do. The card is beautiful and has so much dimension going on. Love the BLING the glitter foam adds to the card. Meredith, as a fellow magpie, I am now also getting out the glitter foam! My craft table is piled high with texturey stuff to die cut. This is beautiful! I love all the sparkle and it's perfect for Christmas! Merideth, your card is so beautiful! Love your sparkly snowflake. I didn't even know that they made sparkly fun foam – where have I been! Very pretty and sparkly–I will have to check my fun foam stash! Hi Meredith! What a faboulos card! I lobe the glitter snowflake! Thanks for the inspiration! Oh how absolutely beautiful, Meredith! I love your idea of die cutting on the glittery foam with the adhesive back, it sure makes it easier to adhere to the card base. Love your blingy foam snowflake–I don't think I have any of this sparkly fun foam, going to have to find some and give it a try! such an exquisite design, Meredith! Love the glitter and layering! What a beautiful combination of elements! And you have just boosted fun foam to a new level of fabulous-ness! I love your card!! Using fun foam is a great idea!! TFS!!! very pretty, love the glitter, i will have to try die cutting fun foam, love the stick pin! What a great idea! I never would have thought of using that to die cut! It makes a beautiful addition to your lovely card! Love how elegant & sparkly your card is! Well done! Beautiful card, Meredith! Love all the details. Wow I love it!!! Beautiful card! Meredith, your card is so pretty and romantic! I love the touches of aqua with the red pom poms! what a great idea! Your cared is so elegant! Thanks for sharing! I love your glittery fun foam! It looks so elegant! Very pretty card! I have not seen the sparkle fun foam, but I will be looking for some to make some snowflakes too! Now, I have to get my hands on some glittery fun foam! I never knew it existed. Your card has so many beautiful layers. Thank you for sharing! Simply Gorgeous! Would love to win the magazine! Wow! Your card is stunning! Love that die cut foam snowflake – gorgeous! Wonderful card. I love the glittered fun foam snowflake. It work so well with the design of the card. I have never seen sparkle form your use of it on that card was so pretty. I am going to look for it on my next trip to the craft store. Beautiful card! Love the colors! Thanks for sharing! What a great effect you get, layering the die cuts! What a beautiful card!! I can't wait to try all of these new things! So many fun details on this card – thanks. Beautiful card – beautiful snowflake! Thanks for your inspiration! Well, where have I been? I've never heard of glittered fun foam, maybe because I'm on a self-imposed spending diet this year. What a great way to get the effect without the mess. Thanks for the wonderful lead to a new product that will go on my list. I haven't tried cutting fun foam yet — thanks for the great idea! Love the glittery snowflake. Wow, I have never heard of that before! Your snowflake looks awesome. Thanks for sharing. I love all the layers and textures on your card! I have some glitter foam, although it isn't self-adhesive, and snowflake dies for my Big Shot. I may have to try that tonight. Thanks for the inspiration! Beautiful card! The foam cut really well. I'll have to try that. What a beautiful card! I've never used foam before, but you make it sound so easy, I sure want to try! The colors are gorgeous and the stick pin is the perfect finishing touch! Thanks for letting me hop! Stunning card! Thanks for sharing! I never thought to cut with that stuff, can't wait to try! Love this! Love all the layers and different textures! Especially love those pom-poms! What a fun idea and a wonderful effect! Thanks for the tips and inspiration! Meredith, you are a real enabler. Now I have to shop for some self-adhesive, glittery fun foam and a big snowflake die. 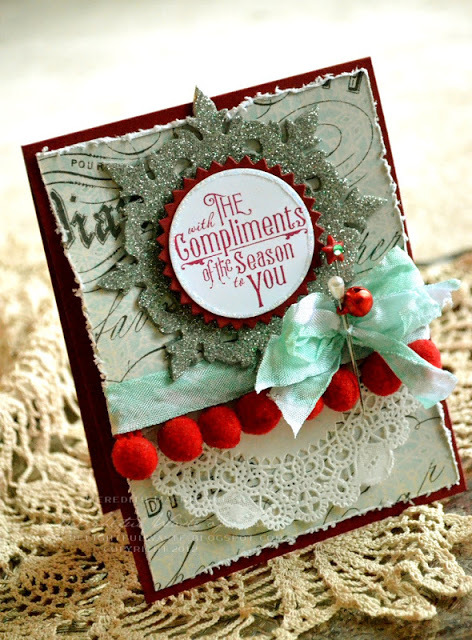 Your card is just stunning with the doily, pom-pom trim, hat pins and sweet sentiment. 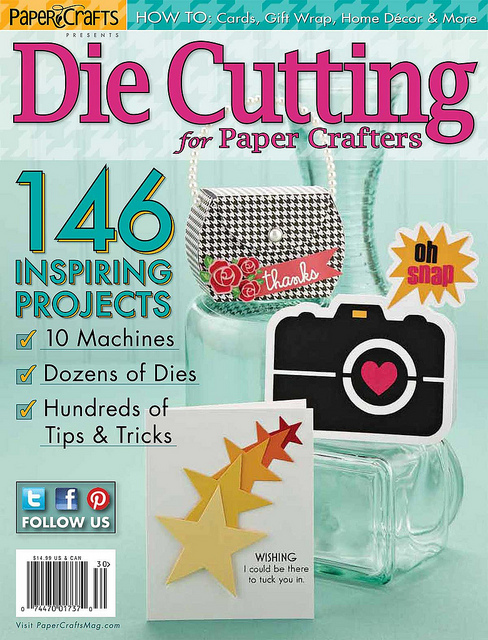 Thanks for the chance to win a copy of this fabulous looking magazine from PaperCrafts! wow didnt think the glitter foam woudl cut so nicely, it makes a beautiful die cut. the card is great, love all the textures and layering. thank you for sharing. I love the bling on your card! Thank you for the inspiration! I love the glitter craft foam–and the die you used–stunning! Great card, of course! Thank you for sharing with us! Hmmm… I think I have some fun foam around here somewhere! Great card! That glitter snowflake is so pretty. I've die cut fun foam and it is fun. Your card is gorgeous. I just love that ornament on here and the way you put it all together looks awesome. sparkly foam? very pretty ! thank you! So classy and sparkly! Pretty! Very pretty. Love how you can use different materials with your dies. Your glittery foam snowflake is awesome. 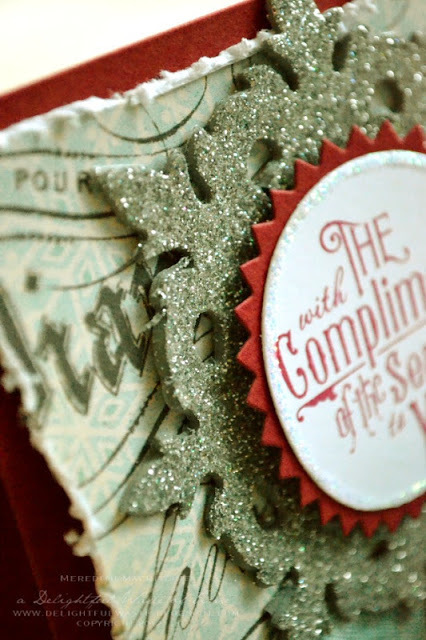 Wonderful – it's like a card and an ornament all in one – gorgeous! Glitter fun foam? Love it! 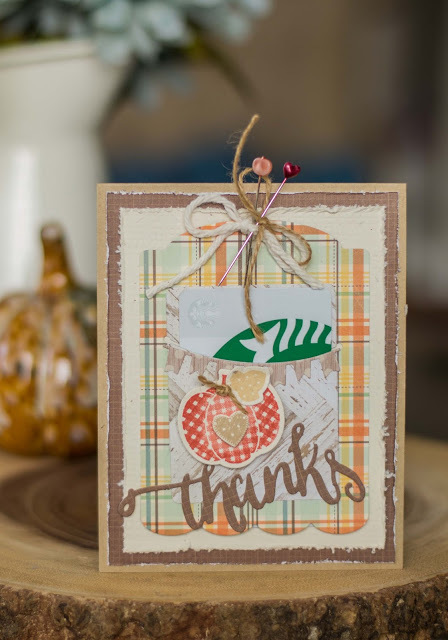 I love the vintage feel and all your beautiful layers on this card! So pretty! Love all the vintage details! So much fun! Love the glittery snowflake. Oh, it's lovely. Why can't that sparkly foam be yours. 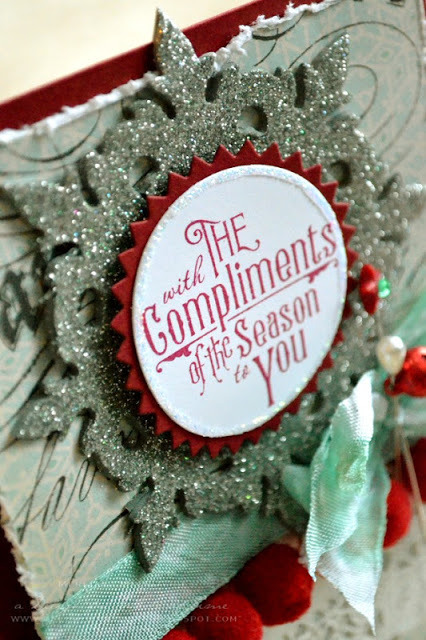 It made a great snowflake and I love inexpensive embellishments that look expensive. I'll have to look at the glitter foam next time I shop. I have learned to use a couple of card stock or the side of a cereal box shim to eliminate having to make multiple passes on the machine because more than one pass gives me the halo cuts on the edge of the die. Wouldn't these glittery snowflakes be great as a refrigerator magnet too. I love the inspiration you have given me. Beautiful Card! I just love Christmas stuff! I LOVE this!!! I am a magpie too, and this just makes me so happy!!! Beautiful, and now I too can buy it guilt free hehehehe! Breathtaking card! I have not used foam (yet). Thanks for sharing the idea! Ooh! Very vintage! Love it! Glittery fun foam!!! Oh, my! Made for a gorgeous snowflake. Great card. I love my Big Shot as it cuts so many things and usually does a good job. Love the bling, the pompoms, the doily, oh my! Beautiful card! love the textures and glitters. Your card is just gorgeous. 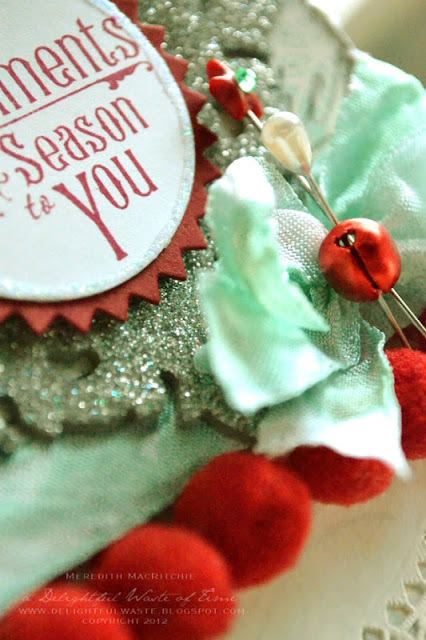 The glittery snowflake pairs so beautifully with the doily and pompoms. Thank you for the inspiration and the giveaway! That looks so fancy for foam. Never would've guessed that's what you used. Love it. Gorgeous card. Wow…So much Beauty. I love it. I understand why you couldn't resist this sparkly beauty! Gave such a lovely card! What an absolutely beautiful card. Gorgeous elements. Beautifully pulled together!